If you’ve ever dealt with these common plumbing problems, you know that it’s best to leave them to a professional. For many of us, being able to take care of tasks around the house is a point of pride. Knowing how to reattach an old doorknob that fell off or how to replace your showerhead gives you that quick rush of self-accomplishment, but as with most things, there are limits to what you can really do. 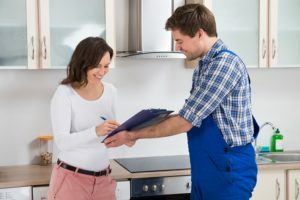 When it comes to your plumbing, some problems just can’t—or in some instances shouldn’t—be handled by anyone who isn’t a professional. These are four of the most common plumbing issues that need a professional to step in. It’s not so much that replacing pipes is difficult in itself, it’s just that if you don’t know what you’re doing, you’re likely going to end up with a huge mess to clean and a handful of parts you’re unsure of what to do with. Just make sure those leaky pipes get handled one way or another before the problem really ramps up and starts to cause you issues. Sometimes homeowners end up feeling like they’re drowning in all their attempts to fix a clogged drain: from plastic snakes, to commercial drain cleaning products, to old fashioned plungers. If you’ve driven yourself up a wall trying to solve a clogged drain problem, it’s time to let a professional step in and take over. Let’s face it: dripping faucets are quite possibly the most annoying sound ever. In addition to the abhorrent droning noise, there’s also the more pragmatic fact that it can lend itself to big water bills. Over time, the silicone washers that form a watertight seal can eventually become damaged and ineffective, causing that obnoxious drip. If you’re dealing with such a problem, it’s best to call in an expert who has the right tools for the job. Much like the annoyance of a dripping faucet, a constant running toilet is similarly frustrating. If you’ve jiggled the handle and taken a look in the back and still can’t figure out what’s going on, the issue may be complex enough to warrant a professional. There’s a chance you’re dealing with a silent leak and a pro can take care of it for you. Dealing with any plumbing concerns that require a professional to step in? Dealing with an absolute plumbing emergency that can’t wait? Let B&D Plumbing know. B&D Plumbing Inc. services the greater Washington D.C. metropolitan area, including Maryland and Northern Virginia. Get in touch with us by calling (301) 595-1141 or follow us on social media including Facebook, Twitter, Google+, LinkedIn, and Pinterest. As a small, family-owned business, we understand how important your home is—and we offer exceptional service that matches! This entry was posted on Friday, November 2nd, 2018 at 2:28 pm. Both comments and pings are currently closed.